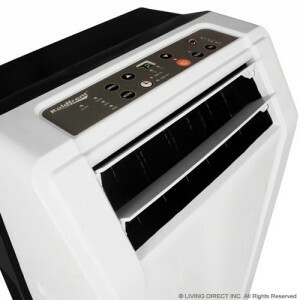 Koldfront - PAC801W : Portable Air Conditioner Review • The Air Geeks, reviews of air conditioners, dehumidifiers and air purifiers. The PAC801W is a compact air conditioner that is suitable for relatively small rooms. This unit is designed to offer a cooling capacity of 8,000 BTU. In addition to cooling, this air conditioner features a built-in dehumidifier that ensures that your room is free from excess moisture. Its direct drain option allows you to use a garden hose to drain the condensate under gravity. Are you looking for a compact air conditioner for your small room? In case you think that the PAC801W meets the requirements that you looking for and you want to know more about its features and performance, then you have come to the right place. We have thoroughly researched about this unit to provide you with reliable and dependable information. In addition to exploring its features and performance, we have also researched to provide you with its strengths and weaknesses. The PAC801W is a compact air conditioner that offers a cooling capacity of 8,000 BTU. This cooling unit is suitable for relatively small offices, bedroom, server rooms, et cetera. According to the manufacturer, this unit is capable of cooling rooms that are as large as 250 square feet. An old school control panel! Are you looking for a multipurpose unit that you can use for your cooling as well as dehumidification needs? The PAC801W offers a built-in dehumidifier that is capable of pulling up to 45 pints of moisture from the air. This dehumidifier pulls excess moisture to prevent the growth of mold and mildew and also to protect your possession from rotting or corroding. 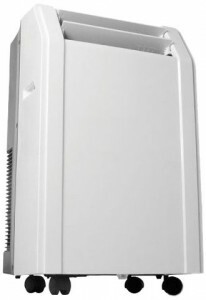 The built-in dehumidifier of the PAC801W utilizes auto-drain mechanism to exhaust the condensate. This mechanism negates the need for manual drainage of the condensate. In high humidity environments, the unit is capable of pulling a lot of moisture within a short time. In such cases, you can use the direct drain option to drain the condensate under gravity. What happens when there is a power outage? This air conditioner is capable of storing settings. You therefore don’t need to reset the unit afresh when power is restored. The auto restart function enables the air conditioner to restart without demanding your attention. In case you would like your air conditioner to start or shut off at a preset time, all you need to make use of is the 24-hour programmable timer. With this timer, you can program your air conditioner to start or turn off in your absence. Furthermore, this unit comes with easy-to-use window kit that fits in most standard windows. The exhaust hose of the PAC801W is poorly designed and it is therefore difficult to attach it during installation. To solve this, many users have decided to buy better exhaust hoses. Although the design of this hose affects the installation process, we have noted that you can unpack and install this system in less than 20 minutes. Easy to set up the unit. We have observed that you can unpack and install this unit in your room in less than 20 minutes. The process is well illustrated in the manual. Portable. It is easy to move this air conditioner from one position to another by pushing or lifting it. Produces a loud sound. Although most air conditioners produce noise, we noted that this unit is noisier than most units of same capacity. Poorly designed exhaust hose does not fit well. It is difficult to attach the hose properly. Some users prefer to buy better quality hoses. Weak air conditioner We have noted that this unit performs poorly even when installed in rooms that are smaller than the recommended size. This thing is giant! It is heavy as well and really tricky to get set up. Does the PAC801W meet your requirements? This unit is suitable for as well as capturing excess moisture. It is suitable for relatively small rooms. Do you think the weaknesses of this air conditioner will have an negative impact on your intended application? If they won’t, then you can proceed and buy it for your small room, office, computer room, et cetera. However, if you feel that this unit does not have the specifications that you were looking for, then you need to consider another brand. But yes, not our cup of tea here at the Air Geeks!